I know I have spent a good deal of time here talking about 'Chocqua' and all that it has to offer, but I am starting to wonder if it isn't the 'choc' part of the equation that I am truly gaga over. Recently I have been all about brown. It's the perfect foil and never fails to make the other part of whatever it's combined with 'pop'. 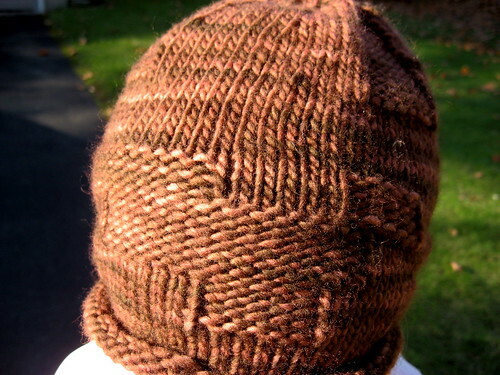 The above-pictured Hazel Knits 'Chocolatier' was just about the most exciting yarn I have ever received in the mail. Can you believe how utterly gorgeous it is? Such depth and rich color. 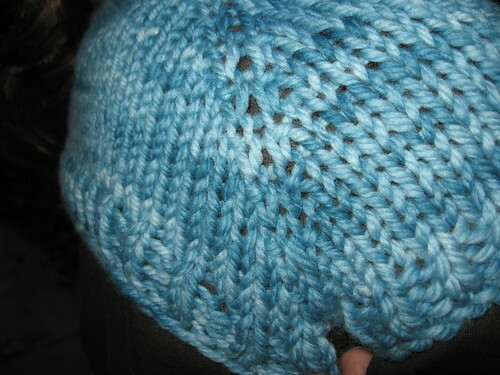 If you haven't given Wendee's yarn a try, you should, because she is also one of the nicest Etsy people ever! Over the break I also indulged in another brown passion: Malabrigo. 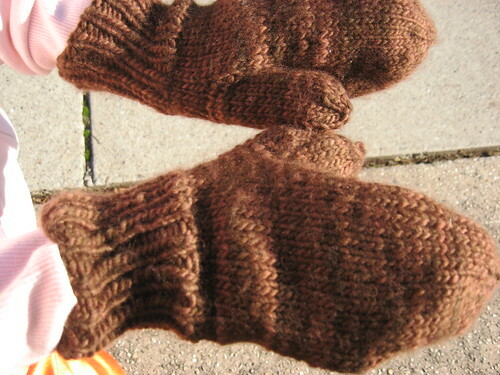 This matchy-matchy hat and mittens combo were knit in the car between PA. and NJ. while listening to the kids battle over the center seat while they called each other 'fat' and 'retarded'. I have so much to be proud of as a mother, don't you think? Once at our destination, I finished them up while chewing glass listening to a relative talk about how global warming is a 'liberal hoax'. Happy Holidays! 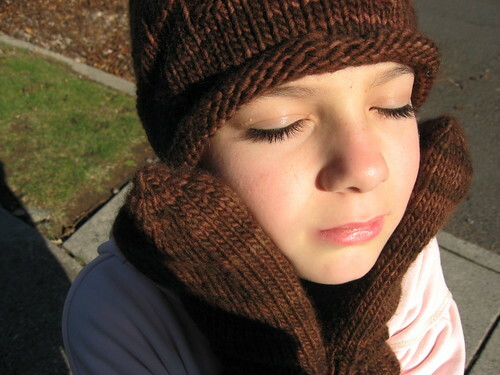 Peeper-lou was an obliging FO model and noted that these were "the softest hat and mittens ever". Malabrigo: you come for the unbelievable array of colors, you stay for the almost criminally indulgent softness. 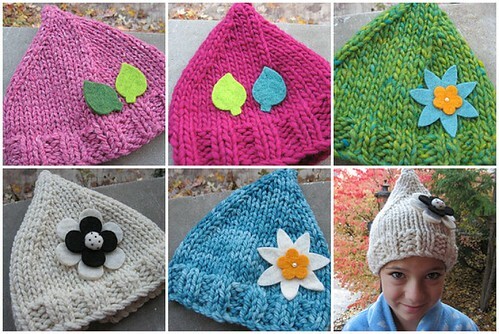 My house has been transformed into a Meathead Knitting Factory as I simply can't stop making these hats. 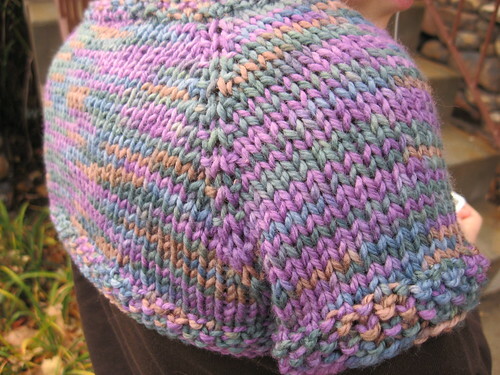 I missed the knitalong craze last year and felt positively taunted by the delightful hats that were madly popping (up) like popcorn on Flickr and Bloglines. Being on the outside looking in isn't such great place to be for this knitter--I even contemplated emailing the mighty Larissa and offering to give her a tidy sum for the privilege to get in on the Meathead game, but I didn't want to come across as impolite, or worse yet, weird. So imagine my pure delight when Miss Leslie i.e. 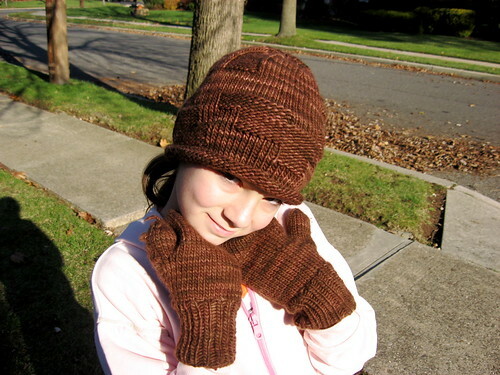 one of the hottest knitbabes out there, posted her Hershey's Meathead along with a comment that Larissa was indeed selling the pattern via pdf to knitters who are too craven or impatient to wait for her much anticipated book Knitalong. So $4.50 on Paypal later, I was in business. This pattern is satisfying many needs at once. 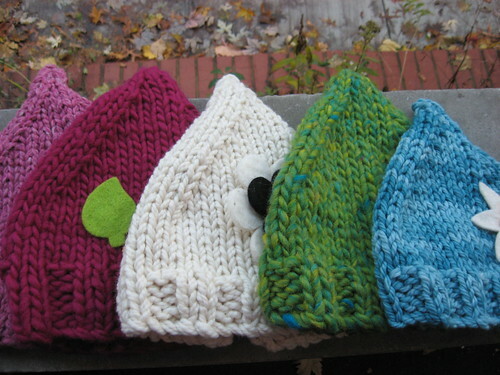 I have spent no (recent) money on yarn for these hats, can you believe it? Being that I have gobs of chunky and super chunky yarn in my stash from the early pre-discipline days of just randomly buying yarn before you really understood what you were going to do with it (as opposed to the rigorous regime of discipline that I'm so clearly adhering to these days), I already had loads of yarn that would fit the Meathead bill. 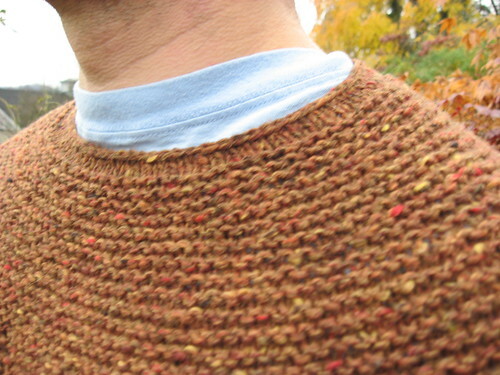 The knit is super-fast, and the pleasure of thinking of an appropriate embellishment is not to be underestimated. Plus, there is the joy of wearing a hat that makes people wonder if you are either a gnome, a character from an Elsa Beskow book, or just plain crazy. Talk about killing many birds with one stone! 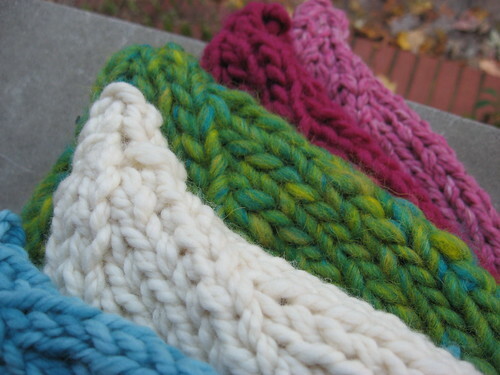 Above you see Meatheads in Karabella Soft Tweed--pink (3 strands), Lamb's Pride Burlyspun--fuschia, Artful Yarns Museum--green, Classic Elite Two.Two--white, and Malabrigo Chunky--blue, and Peeper-Lou. I'm going to ignore the fact that Tween thing said that I looked like 'a demented hobo' in my Meathead hat. This project is #1 with a bullet by far for 2007. Meatheads for everyone! My triumphant 'I finished my Cobblestone, y'all!' post! I am exceedingly happy with this bad boy (the sweater and the grouchy scientist wearing it). The design is quintessentially Elizabeth Zimmermann as it's simply constructed, stylish and fits like dream. Jared took her common sense formula and turned it into something decidedly modern. The Classic Elite, while slightly 'chalky' (Babs' hilarious adjective) does produce a sturdy, appealing fabric that is tweedy yet not too hairshirt-like. Luckily I had enough in my stash as I never quite got around to the Central Park Hoodie that I had originally purchased it for. CPH's loss was Cobblestone's gain, and I am so happy with the results. We are now officially on Thanksgiving break around this joint, and I will be setting up a Meathead assembly line. 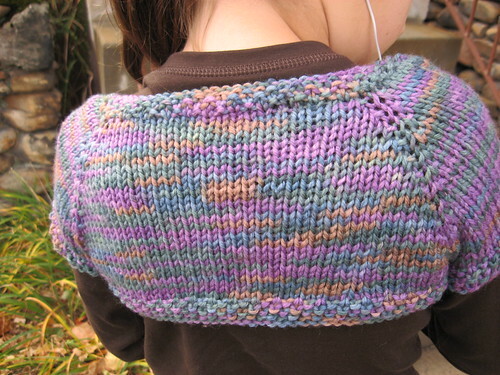 I ordered the pattern yesterday from Larissa (thanks Leslie! 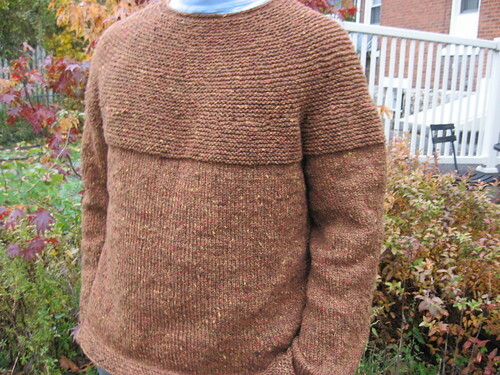 ), and have deemed this my official Christmas knit of 2007™. Everyone will be getting this from me, and I mean everyone! Time to seriously destash. I MEAN it this time. Here is the link to the Destash trainwreck in case my pain needs to become your gain. Sock yarn will be coming soon once the sweater yarn is kaputsky. Short of a clinical evaluation, the arrived-in-the-mail-yesterday evidence below (Shibui orchid, isn't it a looker?) is the closest thing I have to a verification of my state of mental disorder. I wasn't kidding about the not-right-in-the-head thing. Me: Can I buy an I-Phone, just to make myself feel better? Him: Ummm, no. Retail therapy doesn't work. Yeah, I'm a wench, it can't be helped. I was a homecoming queen in the 1980's named Heather (for real), so I'm used to things going my way. But apparently not this time. Oh well. At least I managed to obtain the above pictured Hazel Knits 'Sailor's Delight' sock yarn (my new fave) before finding out that 'retail therapy doesn't work'. Then again I am dealing with the person whose personal motto is "...any day that I'm not dragged into the street out of my bed and beat into a bloody pulp by the State is a good day." This was supposed to be a triumphant 'I finished my Cobblestone, y'all!' post, but instead it's a 'how long is this freaking yoke going to take?' post. I'd show you the picture, but I am not sure that looking at an inchoate mess of Classic Elite Skye Tweed would really do much for you. 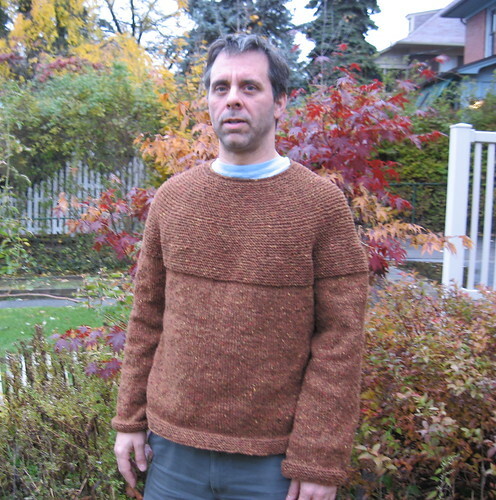 Jared, I love you, but the whole purling thing is really not helping this knitter's blues. Luckily I started a frothy, side-dish of a project that I am enjoying, mainly because I simply can't wait to get to the pompon and do the Kate Gilbert tutorial! 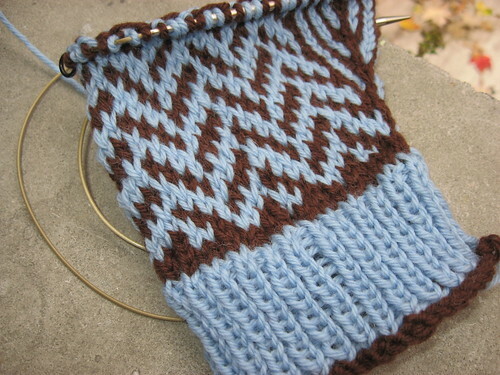 Elliphantom's Herringbone Mittens are proving to be a real gas and a major stash buster. 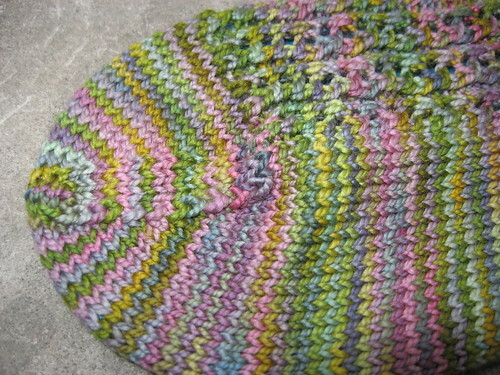 I'm using some Cascade 220 that I have repurposed (remember the whole argyle socks in-the-round fiasco?). I know that the whole Chocqua thing is played out at this point, so I promise this is the last iteration of it you'll see chez A.D.D. Did you know that there is basically a Wikipedia article about everything under the sun, including Baked Alaska? My brother calls Wikipedia 'Master Plots for life', and he's right. 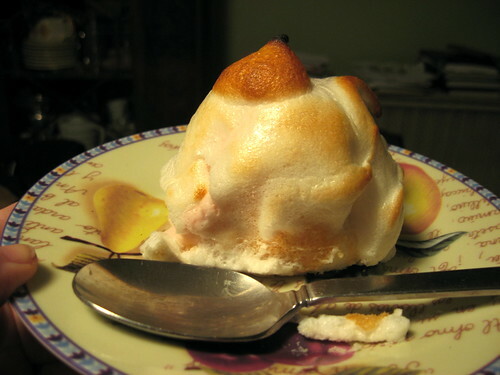 Did you also know that in French, Baked Alaska is called 'une omelette norvégienne'? These things I know because Peeper-lou had her 10th birthday this week, and Baked Alaska was her humble dessert request. As reaching double digits was always a big deal in my family, we tried to give the kid a day to remember, although I can only dream of attaining Leslie's birthday planning and crafting acumen . The dessert was a hit, as were the presents, (although Tween Thing wasn't so thrilled, I'm sure those of us with siblings recall that particular grievance) which included not one but two One Skein Wonders, hand knit in transit recently by yours truly. Making these little gems was a true delight as Peeper-lou not only has the smallest back of any 10 year old I know, but is the only person I've ever met who actually wears shrugs on a regular basis . The one pictured above was done in Lorna's Laces Shepherd Worsted (colorway: Bucks Bar), a lovely yarn that I do my best to acquire lots of whenever I can. Luckily Chicago is where it's from, so I am very well provisioned at the moment. 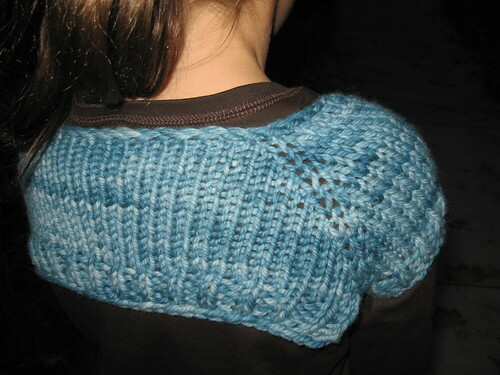 My only modification was doing the sleeve and hems in seed stitch rather than the called-for ribbing. People, it's time to show some solidarity with our writer pals out in Hollywood. 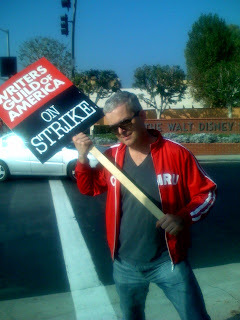 My lil bro (he of the nominated for-an-Emmy-but-lost-to-Justin-Timberlake fame) is a Hollywood writer on strike. Doesn't he look so down on his luck? Soon he'll have to pawn that I-phone and start eating baked beans out of a can like a true hobo. Joking aside, these talented writers are the the only thing standing between us and a world of 24 hour a day shitsville reality programming, so honk if you love quality writing! Things on the knitting front have been picking up after a very looong October. Apparently all I need to do to guarantee that I will not actually finish any socks is to sign up for an event dedicated to sock completion: Socktoberfest. I enjoyed seeing everyone else's socks but didn't manage to finish a pair myself. 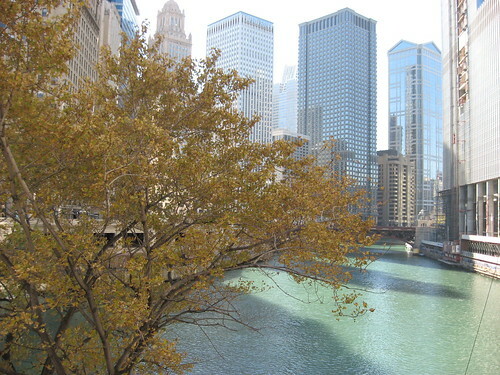 My trip to Chicago was just what the doctor ordered: an utter blast. Did I go to Loopy Yarns and get my grubby hands on some Malabrigo? Why, yes I did! Did I buy so much yarn at that joint that they gave me my very own cloth bag to carry it home in because their regular bag was too flimsy to hold it all? Why, yes they did! Pictured below you see some Malabrigo, some Lorna's Laces Shepherd Sock and Worsted (hooray four supporting Chicago yarn tourism!) and of course some Koigu, which we will file under the coals-to-Newcastle category. While in Chicago I visited the Chicago Cultural Center which was having an exhibit entitled the Hyperbolic Crocheted Coral Reef. It was an actual yarn coral reef that crocheters all over the world have contributed to in an effort to draw attention to this great vanishing natural wonder. Check it out, it is one of the most stupendous fiber art installations I've ever seen. 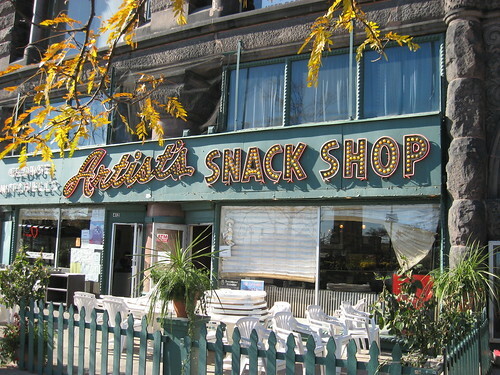 Because I am utterly powerless when confronted with any combination of the words 'snack' and 'shop'! The yarn that you see pictured above is all that remains of the Koigu (a.k.a. 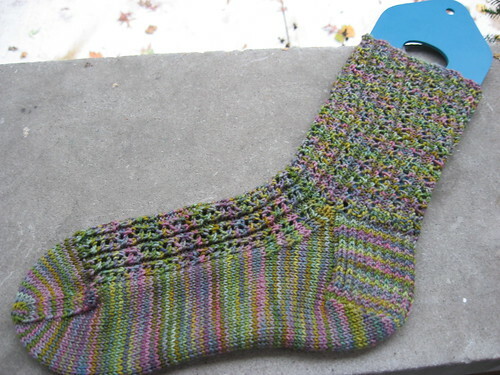 the yarn with the most notoriously short yardage this side of Jitterbug) for my sock swap. But guess what? The sock is completed and shipped off to its recipient, and since today is the deadline for mailing, that's a good thing. If only I could've adhered to such guidelines when completing my dissertation! But then I wouldn't have had the grand ole time with Effexor, and thus never known what it means to live on The Dark Side. In any case, after the dust had settled from me changing my mind as many times as Peeper-Lou and Tween Thing changed their minds about their Halloween costumes, this was a fun sock to make, and Koigu does come through for me once again. Those of you who predicted and inferred that I am making the December Lights Tam out of the Finullgarn are correct! It is my next weekend project, but since the Cobblestone is only moments away from completion, I figure I should wrap that one so as to earn some points with the Darling Resident Marxist Curmudgeon. As I'm going to Chicago this weekend for a conference and will be hitting Loopy Yarns for some Malabrigo, a yarn that I have had a heck of a time getting my hands on, I'm sure to be on some thin ice when I get back. So Cobblestone, you have been warned, you are next!